Home / Blog / PUPS ON SUPS “SOFT LAUNCH DAY” THIS SATURDAY 9TH SEPTEMBER!!! PUPS ON SUPS “SOFT LAUNCH DAY” THIS SATURDAY 9TH SEPTEMBER!!! IT’S TIME FOR FUN!!! – PUPS ON SUPS “SOFT LAUNCH DAY” THIS SATURDAY 9TH SEPTEMBER!!! Come along to Sandy Beach Reserve and try our PUPS on SUPS 30 minute mini classes in support of SAFE INC (saving animals from euthanasia). This is a fun class where anything could happen and it’s all about having a damn good time. We will be on the river from 9.00 am and will structure our mini classes every 30 minutes with a half hour break in between. 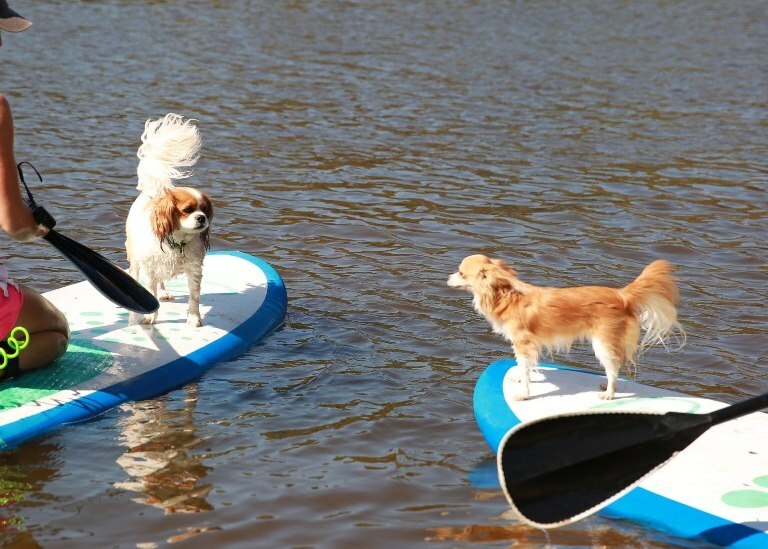 Before getting you both on the board we will go through basic tuition and safety instruction while your pooch is on the lead then let the shenanigans begin! Check out our Youtube vid of what you can expect on the day. SUP Hire will also be available throughout the day at $25.00 per hour. Bring your pooch and bring some mates for a blast on the water or just come and laugh at us. Help support SAFE INC and local business. If your dog is not trained or socialised please consider whether this will be a suitable activity for you both. You may wish to book a one to one lesson first to see how your best mate will take to the water on a stand up paddle board and practice some tips to encourage familiarity and confidence.